Referred to as the watch of the open seas the Oyster Perpetual Yacht-Master, launched in 1992, is a reference among nautical watches and embodies the privileged ties between Rolex and the world of sailing that stretch back to the 1950s. Sleek, sporty and distinguished, the Yacht-Master is just as at home on the deck of a yacht on the open sea as on land in an elegant yacht club lounge. 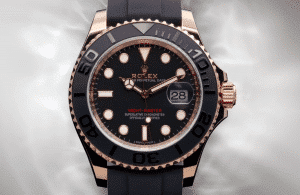 During Basel 2015, Rolex introduced the new black and 18 ct Everose gold version of its nautical Oyster Perpetual Yacht-Master, fitted exclusively with the innovative Oysterflex bracelet developed and patented by Rolex. This technical bracelet combines in a singular way the robustness and reliability of a metal bracelet with the flexibility, comfort and aesthetics of an elastomer strap. At its core lies a super elastic metal blade over moulded with high-performance black elastomer. 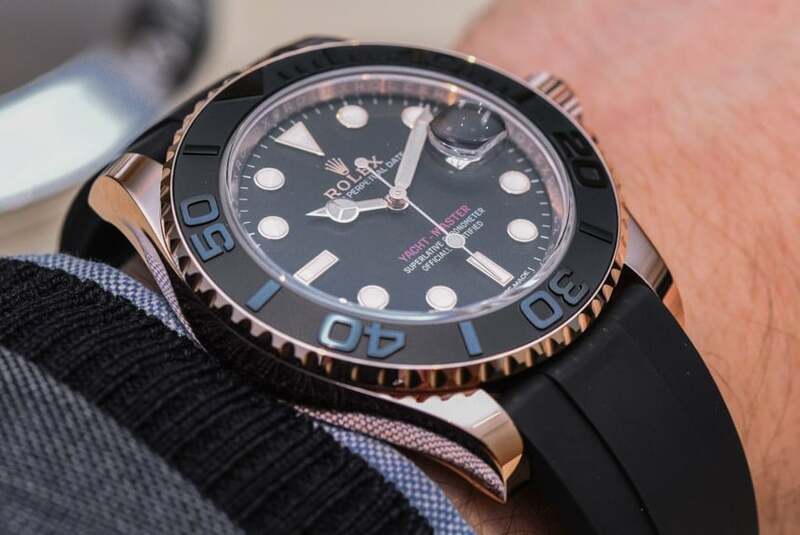 Equipped with self-winding mechanical movements entirely developed by Rolex, the new Yacht‑Master is offered in two sizes: 40 mm and a new 37 mm diameter. Bidirectional rotatable 60-minute graduated bezel, raised numerals and graduations stand out clearly against a matt, sand-blasted background. 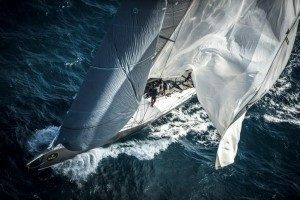 This characteristic and function enables the wearer to calculate, for example, the sailing time between two buoys. Particular to ROLEX this display offers great legibility in all circumstances. The large hands and hour markers are filled with a luminescent material with long-lasting luminescence. A symbol of waterproofness, guaranteed waterproof to a depth of 100 metres (330 feet), is a paragon of robustness. The characteristically shaped middle case is crafted from a solid block of metal gold or steel. 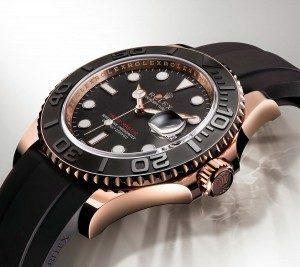 The fluted case back is hermetically screwed down with a special tool exclusive to Rolex watchmakers. The winding crown is fitted with the Twinlock (double waterproofness) or Triplock (triple waterproofness) that offers watertight security akin to a submarine’s hatch.